On Thursday night I braved a chronic cough (kept at bay with lemon-flavoured Fishermen’s Friends) to attend the inaugural performance of Vancouver’s brand new small baroque group, Zephiro. The concert was held at the intimate room of the museum of the Vancouver Italian Cultural Institute on Slocan Street. Since I was on a budget I did not dine at La Piazza Dario Ristorante before the concert as my friends the Bakers did. ZEPHYROS (or Zephyrus) was the god of the west wind, one of the four directional Anemoi (Wind-Gods). He was also the god of spring, husband of Khloris (Greenery), and father of Karpos (Fruit). Ζεφυρος (Greek) - Zephyros (transliteration) - Zephyrus, Favonius (Latin name) - West Wind (translation into English). 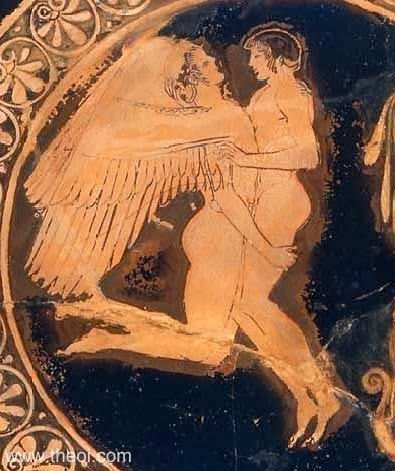 Two figures representing either Zephyros, the winged god of the west wind, holding his lover Hyakinthos in a close embrace; or an allegorical depiction of Love (Eros) desiring and seizing the beauty of youth. 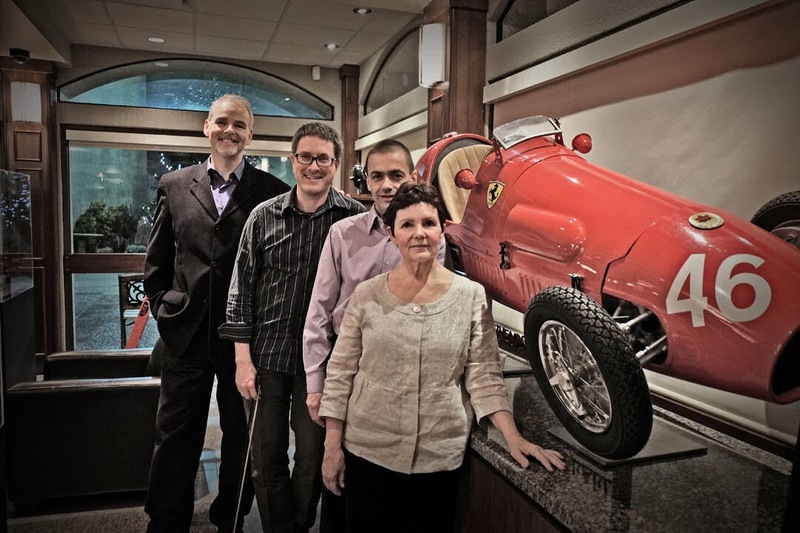 The group Zephiro is made up of Paul Luchkow and Arthur Neele on baroque violins, Natalie Mackie, viola da gamba and Michael Jarvis on harpsichord. I know and I am friends with all but the new member, the Dutch gentleman Arthur Neele who is a compact violinist with a catchy smile and has an imposing knowledge of musical history especially of the Baroque period. I sat front row and the performers where a mere two meters away. It doesn’t take too much imagination to make believe that Zephiro was playing just for me inside my living room and that I was an Italian count. This is baroque music at its most intimate which seems to be something almost unique to our city and which thankfully for me (but not for the financially under-rewarded baroque musicians of Vancouver) gives me the privilege of sitting close and knowing the musicians and best of all I can leave my binoculars at home. 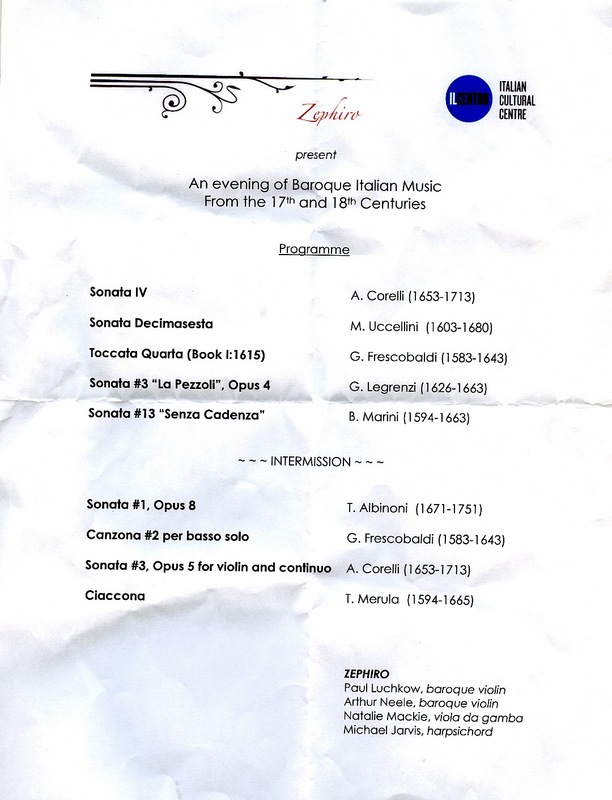 The concert featured Italian composers of the 18th century but also quite a few who where at their best in the earlier 17th century. I am no music expert but I can tell you that the music of the 17th century was not as set down to ready rules as that of the 18th century. 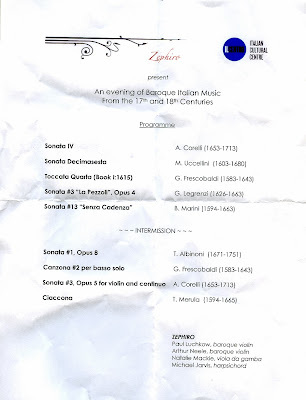 These composers of what some call the Fantastic Period experimented with the use of odd/dissonant notes (I waited and was not disappointed with the last work of the first part of the concert, Biagio Marini’s (1594-1663) Sonata #13 “Senza Cadenza”. On of my baroque friends, virtuoso violinst Marc Destrubé calls them blue notes. There were plenty of these in Marini. The first part also featured a harpsichord solo. I used to hate the instrument as a solo instrument, but thanks to Michael Jarvis and the Pacific Baroque Orchestra’s Alexander Weimann I am warming up to it quickly. The second part had a lovely Girolamo Frescobaldi (1583-1643) Canzona for solo bass but played by both Jarvis and Mackie,.The last time I had heard Frescobaldi played in a concert was back in Mexico City in 1963. Anybody who loves the baroque will always anticipate with pleasure any music of Arcangelo Corelli. There were two sonatas featured on Thursday night. The first, Sonata IV Opus 4 was, for me just a warm-up preparation for the one moment of the night and this was Sonata III Opus 5 for violin and continuo. I am sure that soloist Paul Luchkow must have spent lots of money on baby sitters for his two young sons (or bribed his viola-playing wife) to practice this most beautiful (and most difficult, but then what would I know?) of all of Corelli’s sonatas. If that was not enough to please me for a long time Zephiro finished with a Ciaccona by one of the few Italian composers whose surname does not end in, Tarquinio Merula (1594-1665). While I am no music expert I know a bass ground when I hear one. My fave used to be (until Thursday night, that is) the very famous La Folia made justly famous in by Corelli in his Opus 5 Sonata No. 12 in D minor “La Folia”. 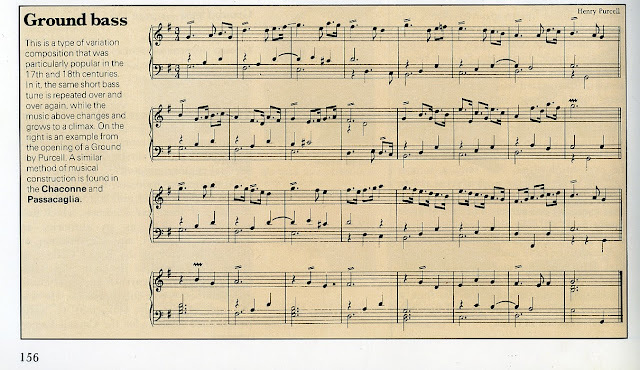 I have written in these parts before that La Folia was sort of the 17th and 18th century’s version of Richard Berry’s Louie Louie. Everybody and his mother (but not Corelli’s) wrote some sort of variation or version. Tarquino Merula’s Ciaccona, a true ground (see picture above), blew me away in Zephiro’s version. In spite of my virtuoso clapping the group did not come back to play it again. This was unfortunate as I had the melody in my head all the way home. I told my wife that I was going to see if I could find it in YouTube. I told her the chances were slim. I was wrong. There have to be more than 20 versions played by small groups, large groups, with pizzicato violin, with mandolins, with a trumpet, with recorders. There are perhaps more versions of this lovely ground than those of Joaquín Rodrigo’s Concierto de Aranjuez (including the one by Miles Davis). But then I did not take my chances to count all the Louie Louies or La Folia. 4393 St. George at the corner of East 28th.at 7.00pm. with Jordi Savall and sung by Monserrat Figueras , not the Ciaconna but beautiful.